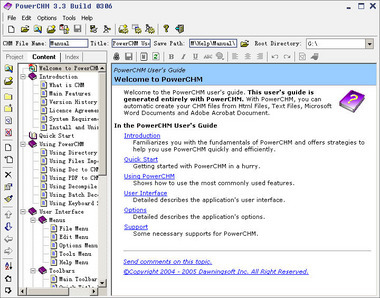 PowerCHM, a powerful chm maker! With PowerCHM you can create professional CHM files from Html Files, Text Files, Microsoft Word Documents and Adobe Acrobat Document. Key features of PowerCHM: 1. Automatically create your CHM files from Html Files, Text Files, Microsoft Word Documents and Adobe Acrobat Document. 2. Make CHM Files by Import Folders and All Sub Folders. 3. 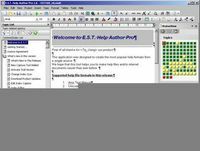 Directly Open and Save Microsoft HTML Help Workshop Project(.hhp file). 4. Edit a .htm or .html File Directly. 5. Automatically generate topic and index item title by parsing from title, filename or text of a specificed line. 6. Decompile a single CHM file or decompile CHM files in a batch.